"We need to actually contribute to this unity that everyone talks about -- not just talk about it," says Point Park College senior Chad Skaggs. "We need to bring everyone together in the same place -- that's what democracy is supposed to be." 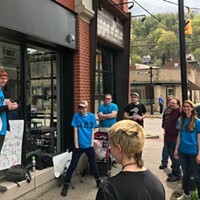 "Everyone," in this case, includes at least 59 local activist groups setting up temporary shop as the "Marketplace of Ideas" in Market Square, July 25. The 22-year-old Skaggs isn't a member of any of them. But he helped organize some of this year's anti-war protests and says he always felt drawn toward the tables of literature being offered. Now he's found a way to gather dozens of the groups in one place. 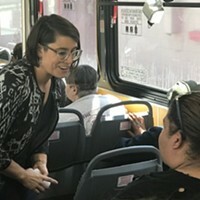 "We wanted to reach people who never experienced the diversity in the social justice movement: 'Look, there's 59 groups and essentially one cause: social justice.' We wanted to get to people in Market Square on their lunch break, who wouldn't usually be in contact" with such groups. Among those represented will be People Against Police Violence, Project 1877, Voice for Choice, Save Our Transit, the Alliance for Progressive Action, the local Independent Media Center and the Religion and Labor Coalition, as well as more mainstream groups such as the Sierra Club, the Greater Pittsburgh Food Bank and the League of Women Voters. All of the groups will be searching for a way to reach the unreachable audience: the everyday Pittsburgher. Free Ride, a bicycle advocacy group, will be making bike-generated slushies to promote their cause: "They've evidently found a way to link the chains of a bicycle to the blades of a blender, so when you spin the pedals it will crush ice," Skaggs says. "The Radical Cheerleaders obviously have an agenda. The Thomas Merton Center obviously has an agenda. But the Fair Housing Coalition -- they just have a problem they're trying to solve. Clean Water Action doesn't advocate a particular ideology. And the Libertartians are a conservative group." He is hoping to bypass the usual television reports altogether: "We're inviting every group to hold a discussion. & Anyone interested can come and hear them, instead of hearing [later on the news] 'Protesters did this' or 'Protesters did that." Still, the Marketplace will be introduced by professor Channa Newman, whose PPC sociology class, "Wealthy White Men," is a red flag for conservatives. It will include a 3:30 p.m. discussion with PPC professor Thomas Mullane concerning: "The Role of Intellectuals in a Social/Political Movement." Skaggs says he is surprised the event has attracted so many groups; he was expecting maybe a third that number. 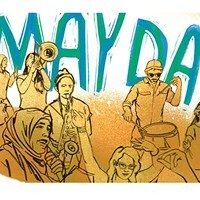 Next year's Marketplace is already planned for May Day. "It could be a little bit jammed," he says, "but hopefully that will lend a little festive quality to it."